I still don’t know where Donna and the “Chin Chin” company was before they arrived in Winnipeg. The show was in Calgary, January 8th to the 10th, but where they were the 11th to the 18th is not known yet. What I do know is that it was bitter cold that week in Winnipeg. Lows in the minus 30s; highs in the minus 20s. Bitter Cold. It didn’t reach zero the entire month. Melodious, artistic and diverting is “Chin Chin,” scheduled for the Walker theatre soon. To Walter Wills and Roy Binder are entrusted the principal parts, supported by a company of clever comedians and a beautiful chorus. 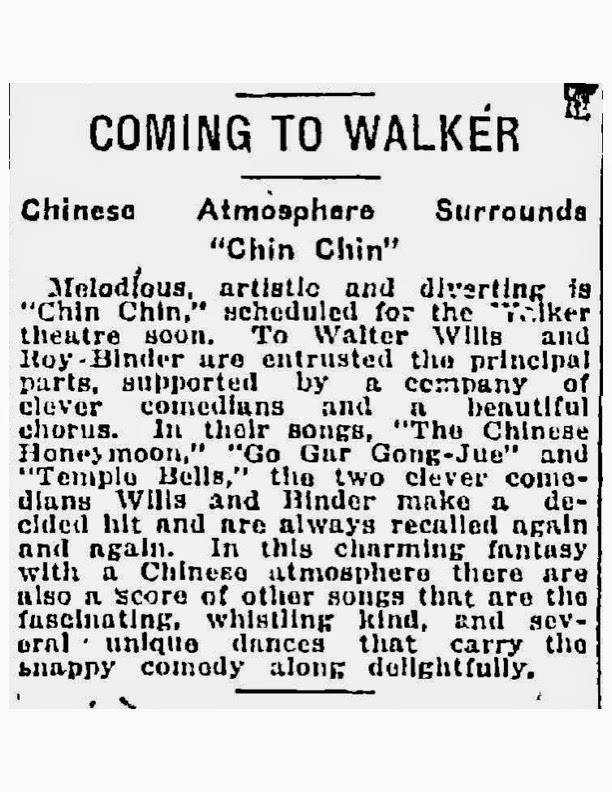 In their songs, “The Chinese Honeymoon,” “Go Gar Gong-Jue,” and “Temple Bells,” the two clever comedians Wills and Binder make a decided hit and are always recalled again and again. In this charming fantasy with a Chinese atmosphere there are also a score of other songs that are the fascinating, whistling kind, and several unique dances that carry the snappy comedy along delightfully. Both the Manitoba Morning Free Press and the The Winnipeg Tribune began running advertisements for the show on January 10th. On the 10th there was also a short blurb in the Winnipeg Tribune about the show. Unfortunately, Ancestry.Com does not appear to have any copies of the Manitoba Morning Free Press for the week of 17 to 22 January, 1920 and Newspapers.Com does not have issues of The Winnipeg Tribune for the same period either. I have been unsuccessful finding other sources for these newspapers, so it is unlikely, I will be able to find reviews of the show. Neither paper of the 23rd or 24th indicate anything other than small ads that typically run during the tail end of a run. The Walker Theatre was a pretty incredible theatre. It was built in 1906 at the cost of $250,000. It was huge. It seated 1,798 people and had a 80 foot wide stage. The stage was 40 feet deep and 70 feet high. As such it was designed for extravaganza’s like “Chin Chin” and its 60 plus individuals. The building was initially intended to be part of a large block but only the theater was built. Consequently, the entrance juts out oddly and the theater external walls are quite blank and plain. 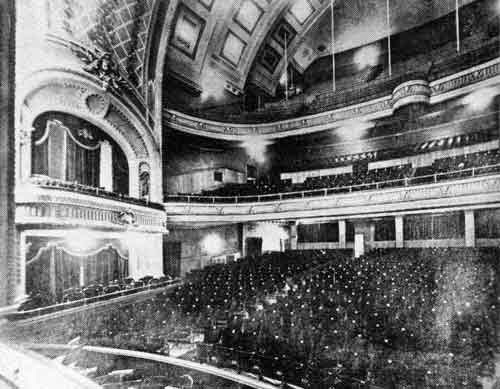 The building was used for live performances until it closed in 1933. It was taken over by the city for taxes in 1936. In 1944 it was sold, renovated for motion pictures, renamed the Odeon Theatre, and reopened in 1945. It operated as the premier single-screen theater in downtown Winipeg for many years. In 1990, it was purchased by the Walker Theatre Performing Arts Group who restored the building’s original architectural features and reopened the theater for live performances in March, 1991. The theatre was also designated a National Historic Site of Canada in 1991. In 2002, the theater was renamed the Burton Cummings Theatre for the Performing Arts. by Ccyyrree – Own work. Licensed under CC0 via Wikimedia Commons. Today the theater has been restored to its former glory. It is a venue for live performances, primarily musical. For example, in March 1015 Celtic Thunder will play there. Check them out on their website. 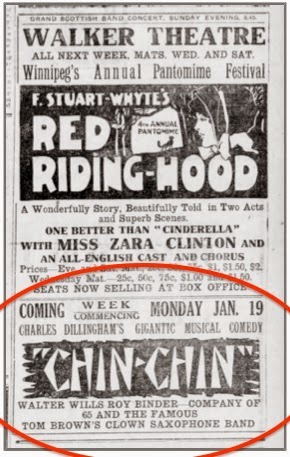 Continue my research regarding where the “Chin Chin” show & company was the week before and the two weeks after Winnipeg.